Liz started her aerial training seven years ago in Tucson, Arizona, with what is now the Circus Academy of Tucson. Before she was introduced to the world of aerial art, she was a dancer. Liz began taking ballet and tap lessons at age 3 continued with pointe, jazz, lyrical, and modern dance lessons. She was a member of The Dance Shoppe Performance Company from 2004-2010 and competed in various national competitions. 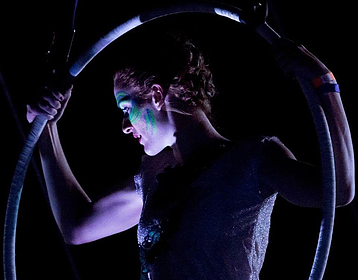 Liz has trained on silks, lyra, trapeze, rope, and numerous inventive apparatuses. She has performed at different events in Tucson, including being suspended 60 feet above Tucson on an inventive apparatus during the All Souls Processions. Liz also could be seen performing with Altitude Aerials in Phoenix, Arizona, including aerial bartending for the Super Bowl VIP Party. Liz has years of aerial teaching experience with The Circus Academy of Tucson and Altitude Aerials, where she taught kid’s beginning and intermediate silks, adult’s silks, and numerous workshops. She is excited to be in Portland with the Afterglow family and hopes to see you in class!